hen DeJon Milbourne, SGA president, takes a seat at the first Senate meeting for the Student Government Association on Sept. 11, it will be a weird feeling for him. After working hard as a senator for two years, Milbourne will have to step aside and watch instead. “I was talking to Lee Franklin, one of our cabinet members, and I was like ‘man have you thought about the fact that we’re going to sit on the side of the room and watch them do what we love?’” Milbourne said. “It’s going to be a little weird cause I’m so used to being on the front lines.” The Student Government Association will have their first Senate meeting on Sept. 11 at 6:30 p.m. in Linville Falls in the Plemmons Student Union. Milbourne is still on the front lines, but must take the reins as president this year. Senate by making sure they have name tags, feel they are valued and know that Milbourne and his staff appreciate them. Lee Franklin, junior political science major and director of external affairs, said he thinks that the Senate is going to be an effective one this year. “I think what we’re going to have is a Senate that is extremely independent and willing to step up to the plate when it comes to leadership and being involved on our campus, more than past Senates have been,” Franklin said. When it comes to what Milbourne wants people to know about SGA, he said he feels it is important for them to know the office is always open. “You can always come by and always get involved and even if you don’t want to necessarily be involved in SGA, come by here anyway and we can point you to the right people if you tell us what you want,” Milbourne said. such as a plastic straw, cannot be recycled because it is too small. If people are ever confused about what to do with their trash, there are graphs located above the trash cans and recycling bins in the dining halls on campus. They are there to make sure everything is being disposed of properly to help Appalachian achieve Zero Waste, resulting in a healthier planet. Anna Muckenfuss│@noel1122│News Reporter system, I was just fascinated by it and how it worked, and so I decided criminal justice was what I wanted to do instead.” At first, Helms said she wasn’t sure what she was going to do with her new major, but as the years went on, and she learned about the opportunity to become a police officer, she became more confident. “It was just something that I had to do. I couldn’t turn it down,” Helms said. Joshua Warren, a senior criminal justice major and one of Helms’ classmates, said that he has always wanted a career in law enforcement. “I’d like to work in behavioral analysis, but I’m still a little on the fence about precisely what I want to do,” Warren said. Over the summer, Helms and Warren both participated in basic law enforcement training. The mission of the program was to develop new leaders of law enforcement, Warren said. “My favorite technique to learn was law enforcement driving,” Warren said. “My least favorite to learn about was civil process; how to serve papers.” Helms said that students would have class for the program six days a week, and physical training at 6 a.m. every day. a climate of inclusion, Williams said. “We can apply this to our campus by continuing to provide opportunities that ‘increase our awareness and knowledge of diversity from an inclusive excellence framework,’” the Associate Vice Chancellor for Student Affairs, Leroy Wright, said in response to Williams’ presentation. “We need to continue affirming identities and building communities across all identities.” Many students in the audience were fond of an analogy Williams made about institutional action that he referenced from his book, “Strategic Diversity Leadership.” He challenged institutions to act like wolves and be collaborative, collective and prepared, rather than like a cheetah and being crisis-driven. The tour concluded on Aug. 29 with two talks to faculty and staff in the Plemmons Student Union. from TS Designs, a company based in Burlington. Each part of creating the T-shirts-from growing the cotton to printing water-based ink designs-happens in North Carolina, according to TS Designs. After the success of their Alta Gracia campaign, this year will be the first year in three years that USAS has not had a year-long campaign. “I think this year is just going to be more about raising awareness in general about the garment industry,” Morgan said. “We’re going to try to get people thinking about where their clothes come from.” Alta Gracia is the only student-ignited product available in the University Bookstore, but the store is always open to App State community members’ requests, Wilkie said. Students can make requests for products on the bookstore’s website, www. bookstore.appstate.edu. a touchdown. The Mountaineers took it from there for the rest of the first quarter with redshirt running back and wide receiver Darrynton Evans returning Penn State’s kickoff 100 yards for a touchdown. Due to redshirting last season, this is Evans’ second straight appearance with a kickoff returned for a touchdown. “That kickoff return, it was pretty big, especially coming off not playing last year,” Evans said. “I really just fielded the kick and then started running. I saw the hole and I was like ‘You gotta be kidding me.’ I just hit it from there.” Shortly after tying the game on Evans’ run, redshirt sophomore kicker Chandler Staton was successful on a 38-yard field goal attempt, giving App State their first lead of the game. The score remained 10-7 throughout most of the first half until Penn State kicker Jake Pinegar tied things up with a field goal of his own with 12 seconds left on the clock. Redshirt senior running back Jalin Moore had a strong fourth quarter, rushing for 57 of his 92 yards and scoring the go-ahead touchdown for App State with about two minutes to go. Unfortunately for the Mountaineers, this left enough time on the clock for McSorley to lead Penn State back down the field to score the game-tying touchdown with 42 seconds left. Junior running back Miles Sanders scored the eventual game-winning touchdown on the Nittany Lions fourth play of overtime. Despite the tough loss, Satterfield said he has confidence that his team is ready to take on the rest of the season. “They are so fired up right now that when we get back to Boone, we could practice right now. Our guys are encouraged by what we did tonight. They’re hurt but they’re encouraged and they’re ready to play again. That’s just the mindset of our guys right now,” Satterfield said. 1. Graduate transfer wide receiver Dominique Heath fights for the ball against a Penn State defensive back. 2. After the turnover in overtime that lost the Mountaineers the game, junior cornerback Clifton Duck clutches his helmet in disbelief. 3. Senior running back Jalin Moore buries his face in his helmet after losing to Penn State on Saturday night. 4. Senior cornerback Tae Hayes gets ready for the next play against Penn State. 5. Junior cornerback Clifton Duck emotional after a tough loss to Penn State. Game 2 / Saturday, Sept. 8 / 6 p.m. / ESPN+ / Jerry Richardson Stadium, Charlotte, N.C.
App State will travel to Jerry Richardson Stadium on Saturday to face the Charlotte 49ers for the ﬁrst time in their history. Since resurrecting their football program in 2013 after a 65 year hiatus the 49ers have posted a record of 18-41, the third worst of any team in the country in that time, according to teamrankings.com. In that same space, App State has produced an overall record of 41-22, including a record of 36-9 in their last 45 games. Only Alabama (41-4), Clemson (41-4), Ohio State (40-5), and Wisconsin (37-8) have played better over that period. This is the ﬁrst of two games the programs will play as Charlotte will travel to Kidd Brewer Stadium in Boone in early 2019. Prevent Penalties: A huge reason that the Mountaineers lost to Penn State is that they lost 100 yards (equal to the entire length of the ﬁeld) on nine penalty flags, compared to Penn State who lost only 10 yards on two penalty flags. The Mountaineers had several chop block and unsportsmanlike conduct penalties, both of which cost a team a 15-yard loss. If App State wants to be more successful against Charlotte, and throughout the rest of the season, they need to cut down on mental mistakes and play a clean game. 3 KEY POINTS Keep the defense off the ﬁeld: One of App State’s big advantages against Penn State was their time of possession. The Mountaineers held the ball on offense for over 32 minutes while the Nittany Lions had it only for 27 minutes. App State’s defense having those extra ﬁve minutes to recover was essential in their fourth quarter comeback, and a fresh defense will always perform better than a winded one. Open up the run game: While senior running back Jalin Moore rushed for 92 yards against Penn State, he gained only 35 through the ﬁrst three quarters of the game and averaged only 4.9 yards per carry for the game. App State’s offense cannot function effectively if it must rely almost solely on its passing attack to score points. Redshirt sophomore quarterback Zac Thomas and graduate wide receiver Dominique Heath also posted rushing attempts against Penn State. If the Mountaineers can get their rushing committee to run the ball efﬁciently, they will start to put up serious points. Lions in front of a crowd of 105,232 fans. Thomas impressed on Saturday, finishing with 270 passing yards and two touchdowns on a 65 percent completion rate to go along with his 43 yards and another touchdown on the ground while nearly willing the Mountaineers to the big time upset. In the early part of the fourth quarter and at the beginning of the Mountaineers’ comeback, Thomas left the game for a play after taking a big hit and getting the wind knocked out of him. Redshirt freshman quarterback Peyton Derrick came in and completed a 22-yard pass that set Thomas up for a touchdown throw to sophomore wideout Malik Williams on the next play to cut the Penn State lead from 14 points to seven with 13:39 left in the game. “He’s a competitor, that’s one thing I love about Zac. He competes his tail off and our guys feed off of that,” Satterfield said. “When you go out because you got hit that hard, and you have to come to the sideline and we don’t even know if you’re coming back, and you come back the next play and go score—it’s incredible heart. That’s what our team is made of.” Penn State eventually won in overtime 45-38 after senior cornerback Amani Oruwariye made an outstanding interception on a would-be game-tying pass in the end zone from Thomas. “The corner made an unbelievable play. He reached right over top of Corey and made a great interception,” Satterfield said. “That’s football, you have to be able to make the plays and their guy made it.” After the debut that Thomas made, it will be a fun ride for the rest of the season to see how he handles the ups and downs of a full season of collegiate football. Thomas and the Mountaineers turned a lot of heads on a national scale with the performances they put up during the season opener. App State will travel to UNC-Charlotte next week on Saturday for a 6 p.m. matchup with the 49ers. It will be interesting to see how they respond going up against a nonPower Five team in their first action since the heartbreaking overtime loss in University Park. Meetings are in Plemmons 217 Sundays and Thursdays at 7 p.m.
two stop lights. Andy happened to live in that town,” Shoaf said. For Le Beau to reach Florida to find work, the police department required fingerprinting signed by a law enforcement officer. Le Beau wanted this to be more covert so he asked his new acquaintance Shoaf to do it. “I was just so impressed by him,” Shoaf said. Shoaf did not expect anything to come out of asking to see Le Beau again. Le Beau eventually did come back and visit though, and the relationship built from there, Shoaf said. To read more, visit our website theappalachianonline.com. way around can be helpful for international students who might have questions about campus, Pepper said. Additionally, iPals can also offer language practice for both U.S. and international students. More than 70 percent of international students at App State come from Asia, but the university also sees students from Europe, South America and Africa, Jenkins said. For students that are taking foreign languages, their iPals can be instrumental in pushing their education forward. “It kind of forces them to step out of their comfort zone,” Bartolac said. “Everyone here doesn’t speak what they speak, so they’re kind of forced outside of whatever language they take to speak English.” Alongside language practice, iPals can help each other learn about their respective cultures. Domestic students can help teach their pals about American and Appalachian cultures while they’re here, but their international pals can also teach them about their country’s culture. This is especially helpful if a U.S. student plans to study abroad in that country or travel there outside of school. The club also pushes students to expand their comfort zone socially, Pepper said. “It’s really easy for international students to kind of stay in their own bubble or just hang out with other international students,” Pepper said. “So this is a really good way to make sure they’re meeting other Americans or people that have been attending App State for a couple of years.” To read more, visit our website theappalachianonline.com. grandmother simply responded, “It’s a gift.” Miller’s grandmother, who also had the ability of insight, reassured her granddaughter that she was blessed and should not be afraid. “We all knew I had a special gift. My grandmother helped me through it and as I got older then I knew I was supposed to do psychic readings with people oneon-one,” Miller said. Miller said she has dealt with her fair share of skepticism. Many people did not believe her when she revealed to them things she saw in their futures. “Some people would listen, some wouldn’t believe but when the realities that I told them came to pass they knew,” Miller said. Because of Miller’s trade and her gift, some have condemned her practice. Although Miller and her family subscribe to the Catholic faith and practice the belief that there is only one god, she has had people come to her storefront just to denounce her practice. “They’ll say it’s not with Jesus and condemn it,” Miller said.“We are allowed to worship him in all different ways. It’s not a bad thing, it’s still spiritual.” For Ervin Thielen, PR advocate for App State’s Pagan Student Association, following the parameters of Christianity never felt right. Although he, too, has experienced hostility due to his spiritual divergence, Thielen keeps an air of optimism. of therapy is not intended for lasting change. “You pay a few bucks and can walk out without needing to change your behavior if you disagree with the psychic’s analysis,” Steele said. “The psychic may have genuine goals to help a person but simply telling someone what is their issue does not mean that the person will change his or her behavior.” Psychic Kim’s new location is on Boone Docks Road at the intersection of Hampton’s Body Shop, Inc. and Carpet House. Readings range from $20 to $70 and she gives insight into everything from life to love. beneficial for themselves but to others who have not had the opportunities afforded to other locations. “There’s not enough film opportunities in the Boone community. Not enough narrative film,” Frazier said. “I think it’s a cool opportunity for some people to get involved with us on set.” An incoming student or a community member of Boone who is interested in narrative film might have a production company to support their projects in the future. The duo is contemplating the decision but will think on it after they finish more projects, Frazier said. Grant and Frazier hope to have the film finished soon and are working with I.G. Greer Hall and the Greenbriar Theater to have a showing of “Helen” on campus. special education major, said they choose to shop at Walmart. “It is cheaper and a lot easier to buy a bunch of food at a much cheaper price than anywhere else,” Edwards said. Food Lion was the second cheapest at $61.04. Like Walmart, Food Lion has no student discount. Publix then came in third with a total of $66.90. It has a 10 percent student discount every day of the week until the end of September. Then, students have a 5 percent discount until the end of the school year in May. Kate Geisinger, a freshman psychology major, said she chooses to shop at Publix. “It has better quality ingredients and their produce is better than places like Walmart,” Geisinger said. Ingles came next with a total of $70.94. It does not have a student discount but many students choose to pay the higher price for the organic products it offers. Harris Teeter is the second most expensive grocery store with a total of $72.80. It does, however, offer a 10 percent student discount with a VIC card until Oct. 2. After, it gives a 5 percent discount until May 31. Lowes Foods is the most expensive grocery store at $73.34. It gives a 10 percent student discount only on Sunday, provided students bring their Lowes card and student ID. The grocery stores had different prices for the same item. The difference between the cheapest and most expensive item ranged from $0.13 for a pack of ramen to $4.33 for a pack of six paper towel rolls. not overpriced. This includes the cheapest bananas at $0.35 per pound and eggs at $1.79 per dozen. “We hang our hat each day on our quality and service we provide,” Mark Taggart, Publix assistant manager, said. Publix also has excellent customer service. “The only difference between us and any other grocery chain is the people,” Joel Wise, Publix manager, said. “The people here care about the shopper’s needs.” Some students prefer to shop locally. Becca Coleman, a senior elementary education major, said she chooses to shop at Be Natural Market. “It is full of local things from the area and also really healthy options for fresh food,” Coleman said. AppalCart’s Twitter. The Watauga Democrat released an article June 14 detailing the proposed route changes. It confirmed the changes July 2 and released another update Aug. 17. AppalCart also released several tweets between the time of the proposed changes and the day the changes occurred on Aug. 20. AppalCart did not fail to communicate these changes, but it did not do so adequately. This, combined with students not doing their due diligence, has led to a mess in the first few weeks of the semester. AppalCart did attempt to inform people over Twitter, however the AppalCart account only has 3,000 followers. Each of its announcement tweets averaged less than 10 retweets and likes. 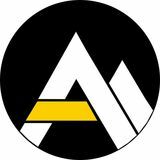 AppalCart has not updated its Facebook account since Aug. 10, 2016. Facebook is one of the foremost methods that organizations use to interact with consumers. The fact that AppalCart chose not to use Facebook to advertise this massive shift is downright neglectful. Hughes claimed AppalCart partnered with App State to get the word out to students, yet the only evidence of this that could be found was an announcement on the App State announcement page advertising one of the public comment meetings in April. Students are right to feel that this change came out of the blue, because it did. The final changes were proposed in June, after the majority of the student population of Boone had left. While the changes were based on data gathered while students were in town, it was still bad form for AppalCart to propose the final changes then. However, ignorance isn’t an applicable excuse here. It’s AppalCart’s job to get people where they need to go, but it is the students’ responsibility to know how AppalCart is going to do so. In regards to the quality of the new routes, students need to give AppalCart and its drivers time to adjust. “Bus operators, as well as customers, take a little bit of time to get used to changes,” Ritchey said. “The first couple weeks of a semester are just not representative of travel conditions in a university.” This is the first massive overhaul to routes that has ever occurred at AppalCart. In previous years, the changes were minor, with only a route or two being added or modified. There is no precedent for AppalCart to rely on, which is why they need to be given time. “There’s some things we know we have to work on, and we’re working with ASU to address those things, but overall I think it’ll work out,” Hughes said. International Student Teaching Information Session Reich College of Education Rm. 124A 9-10 a.m. The Appalachian Staff Meeting Plemmons Student Union Rm. 217 7 p.m.
Resume Clinic Plemmons Student Union 11 a.m.-1:00 p.m.
“Love Simon” I.G. Greer Auditorium 7-9 p.m.
Eric Luke and Hunter Cox Piano Recital Rosen Concert Hall 6-7:30 p.m.
A Taste of Dialogue: Identities Plemmons Student Union, Table Rock Rm. 6-8 p.m.
Senate Meeting Plemmons Student Union, Linville Falls Rm. 6:30-7:30 p.m.
Make Your Own Vision Board Plemmons Student Union, Linville Gorge Rm. 5:30-6:30 p.m. 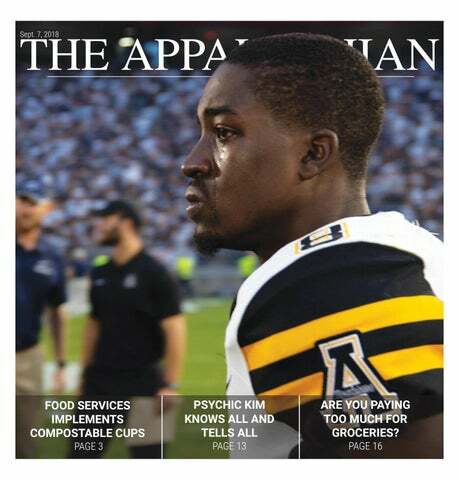 Pick up the new issue of The Appalachian at newsstands across campus! Evening of Encores Roden Concert Hall 8-9:30 p.m.
Alex Lapins Guest Tuba Recital Rosen Concert Hall 8-9 p.m. Among Wolves film screening and Q&A with director Shawn Convey Greenbriar Theater 5-6 p.m. Money Moves Plemmons Student Union, Linville Gorge Rm. 7-8:30 p.m. The Appalachian Staff Meeting Plemmons Student Union Rm. 217 7 p.m.